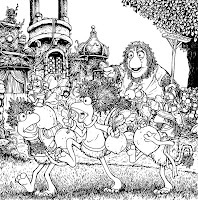 I am still nailing down my plans for a Free Comic Book Day (FCBD) appearance, but I do know for certain that Archaia is doing another FCBD flip-book. 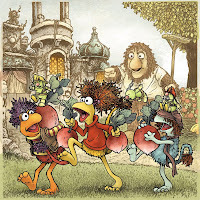 Last year they published a Fraggle Rock/Mouse Guard issue...This year it will be a Dark Crystal/Mouse Guard issue! 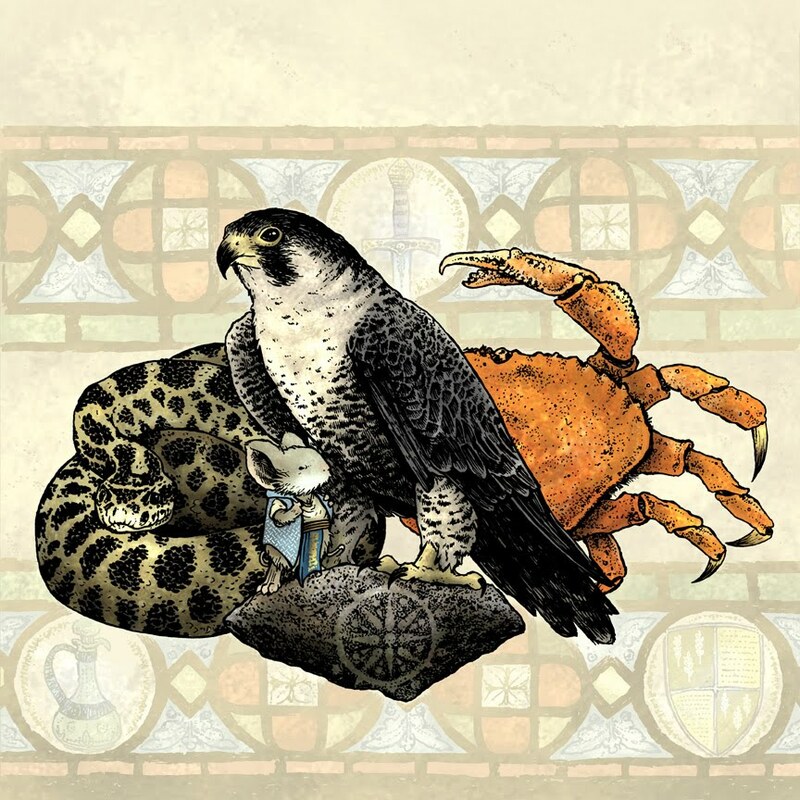 The Mouse Guard story is 6 pages long and to the left is the cover for my side (the other side will feature a Brian Froud Dark Crystal cover!) Free Comic Book Day is May 7th this year, and I encourage you to go try some books you wouldn't otherwise try & try and get some of your non-comics-reading friends to tag along too. 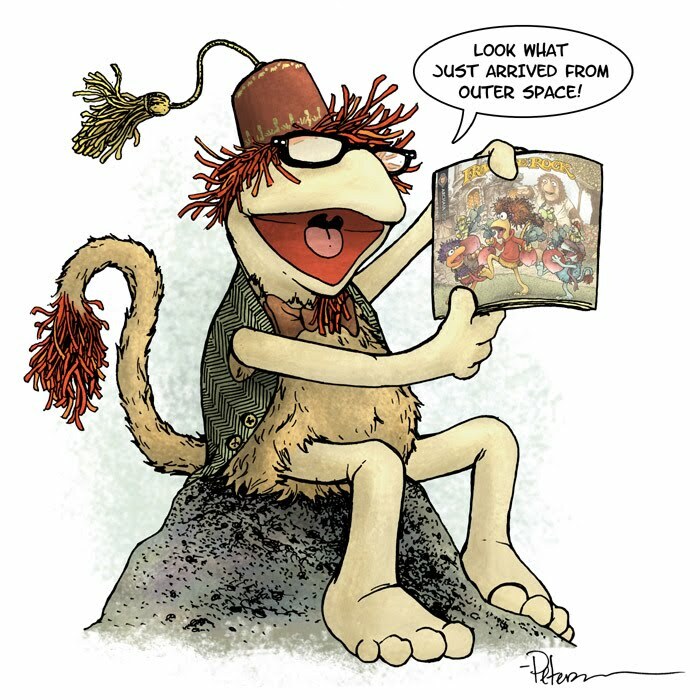 To celebrate the release of Fraggle Rock Vol.2 Issue 1 (Cover B has my artwork which I featured last week on the blog showing my process), Just for fun I drew a Fraggle excited about the new issue and tweeted it. I was honored when the folks at Archaia & Henson retweeted it. The plan was for me to do a Fraggle story in Volume 2 of the series, but because of my Black Axe schedule, it wasn't possible, so fingers crossed sales of Fraggle books warrant a third volume! 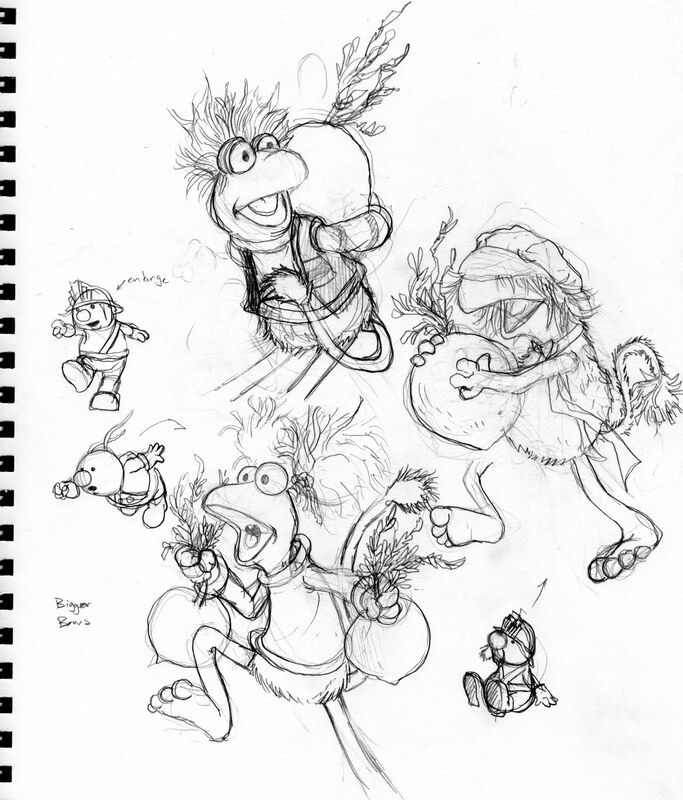 The Fraggle I drew for the promo is my finished concept for a Fraggle puppet I started building last spring. His name is Gib (my paternal Grandfather's nickname). The hair, goatee and glasses are all just placed on with no adhesive at the moment (in fact the glasses are my every day glasses) After Black Axe is finished I hope to be able to finish the Gib puppet with the finished features and clothing shown in the drawing. The first Issue of Fraggle Rock Volume 2 will be out tomorrow. My artwork is featured on the 'B' cover, and though I had posted the final cover art a while back, I thought I'd share the process. 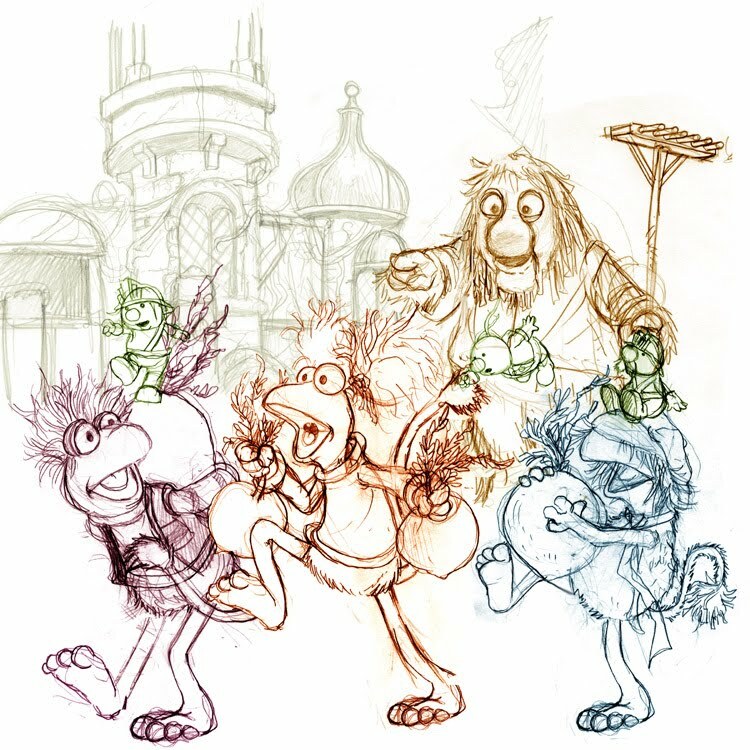 I had a different idea for the cover originally, with Boober and Junior and one Doozer being the only characters, but due to some similatrities in concept of a cover already turned in, I had to alter my plan. I think one of the great things about Fraggle Rock is the three different species and their understanding and relationships to one another, so I really wanted my cover to have Fraggles, Doozers, and at least 1 Gorg with the size relationships being exploited. 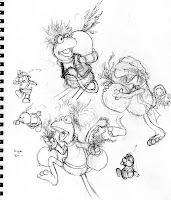 Unfortunately, there is no good way to show a Gorg at full height with a Fraggle AND a Doozer without the latter two being diminished and too tiny to draw well. 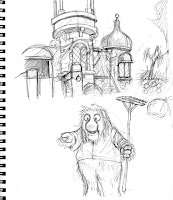 Forcing the perspective by showing the Gorg castle with Junior standing by it helped show that even though he is about the same height on the page as the Fraggles in the final piece, the scale to the castle and garden growth and tools we understand that he is a giant to them. After I had sketches of all the components I would need, I scanned them and tinted them to assemble in a layout template for the covers's specs. This is a stage where I can play with proportion, nudge the characters closer together or further apart, rotate character's arms or legs, or the character altogether. 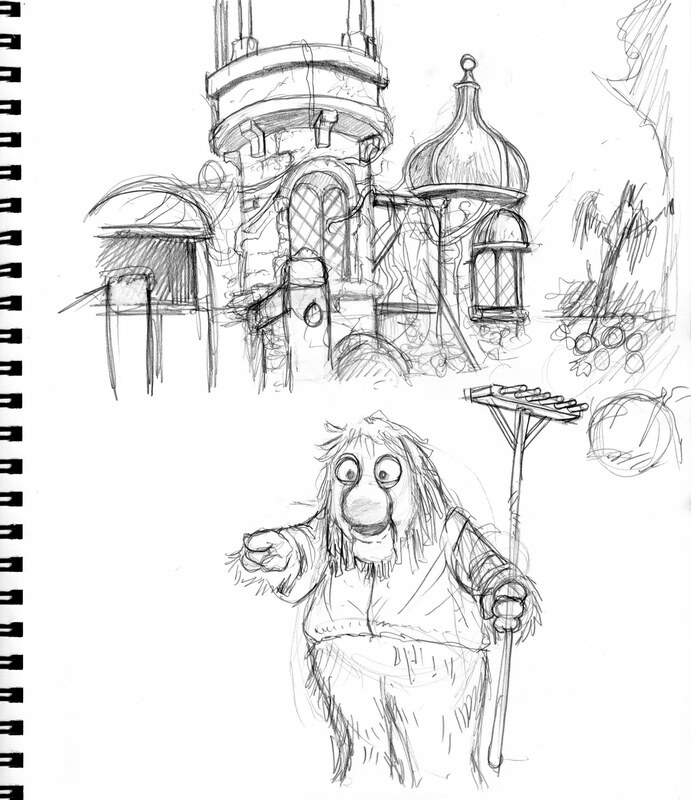 I tint the different characters and elements differently so I don't get lost in the mess of sketchy lines. The final layout was approved by Archaia and Henson, so I printed it out and used it as a guide while I inked on strathmore 300 bristol on a lightbox. 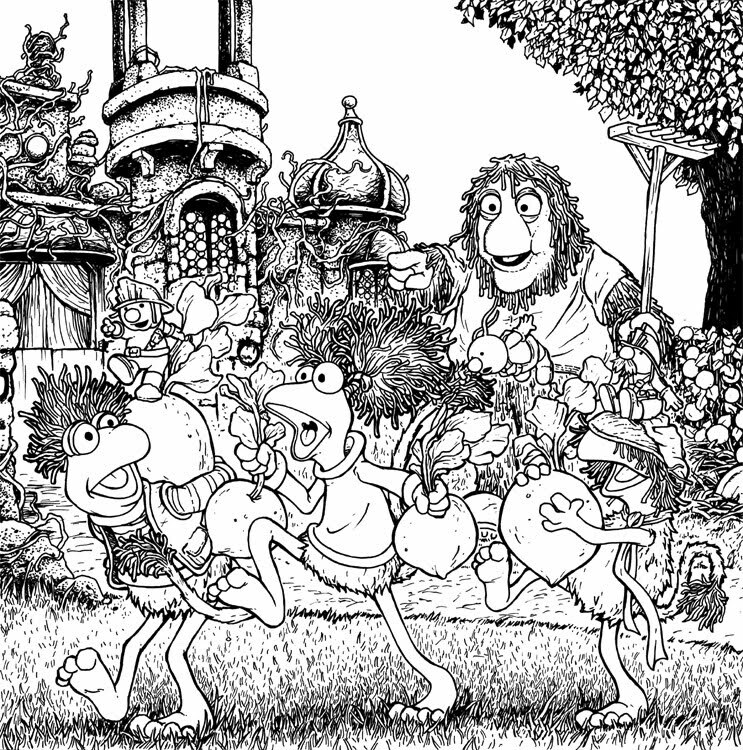 This cover had so much going on, that I worried about how congested the inks were and without a lot of line weight variation, but for Fraggles, I didn't want to go too heavy on the inks and shadows, I wanted a lighter feeling to them than that and planned to fix the lack of focus in color. While coloring I noticed that several of the overlapping characters and background/foreground elements had a similar color or value. I kept flatting the piece (establishing color areas, not necessarily final color choices) planning to deal with the depth of field issues once I got into rendering. Here again is the final cover. In this rendering stage I did a few things to make sure that things popped off one another, I added a color hold and muted things in the background (relative to the Fraggles) I used a color hold on the grass to tone down the 'noise' on my inked grass lines. 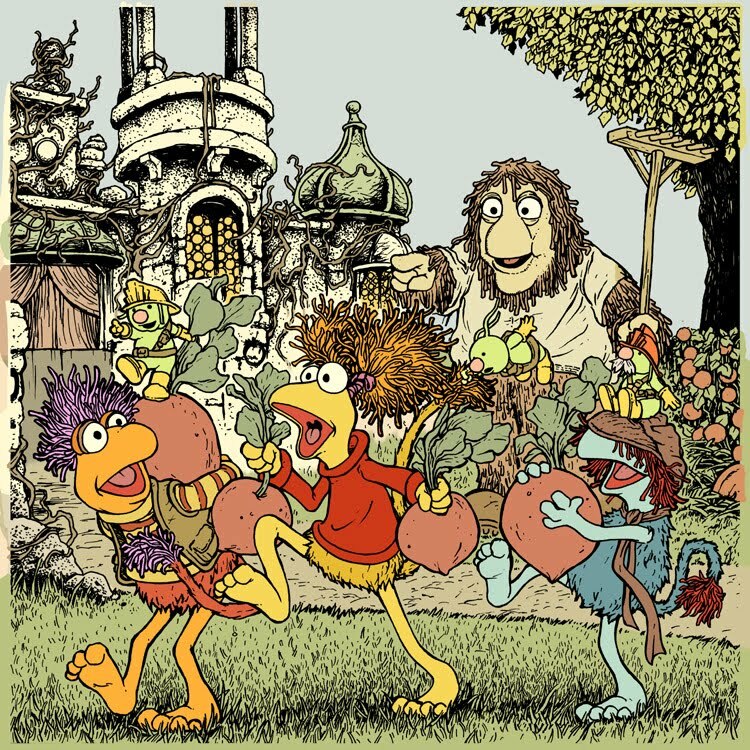 I altered some colors slightly pushing them to the ends of what makes them that color (the radish leaves are more blue green while the Doozers are yellow green...The Radishes themselves became more of a muted Red violet to pop them away from the more middle of the road reds on the Fraggles). An Art History professor I had did an assignment on the concept of "Art about Art" where you were asked to do some piece of artwork based on another artists' work, or specifically one of their pieces. I made a variable puzzle based on the work of Piet Mondrian. 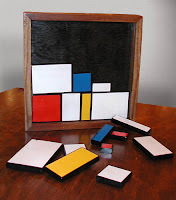 The pieces were all wood, and two sided (sometimes with different colors) and they could be arranged to fit in the frame in a variety of ways. I cut a channel into the frame so that a sheet of plexiglass could be slid in once you had an arrangement you liked for display. I did all this, even though I never had the particular class with that professor that this assignment was given...but I heard him talking about it, and wanted to try my hand at it. 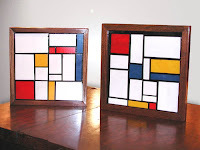 The result (these two Mondrian puzzles) were Christmas gifts for my two sisters that year. 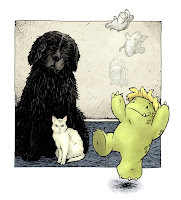 Denver Brubaker, cartoonist of the webstrip The Checkered Man sent me this great drawing of Kenzie. I really like the feet on Kenzie and also the watercolor background. Thanks Denver! Fishers: Black Axe Issue 1 has some Fishers as one of the obstacles Celanawe and Em must face before starting their quest. 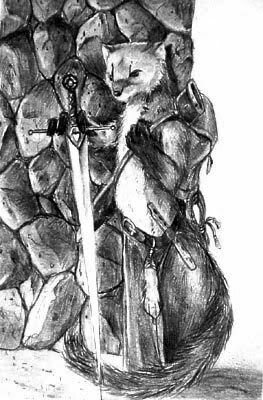 I had planned on having fishers in Mouse guard as far back as the late 90's. 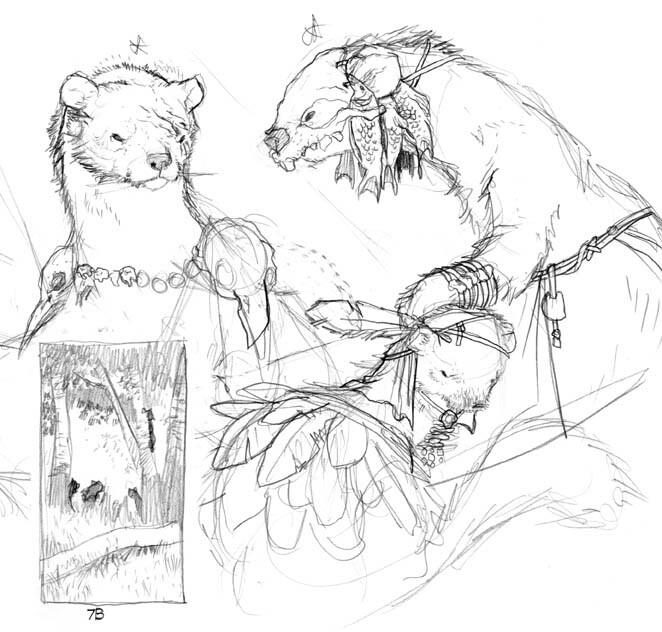 The drawing on the left is a concept for a lone adventuring fisher I drew back then. Skip ahead to me working on Black Axe in 2010. I had a few goals for the larger-species-encounter in the first issue. I wanted to show a different resolution than I had when mice had faced a snake, crabs, & an owl in the previous series. 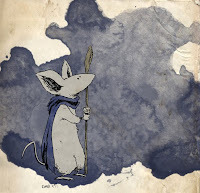 This time I needed the threat to be more than a single Guardmouse would take on, where avoidance was the key to success, instead of confrontation. These fishers needed to be fierce and scary. 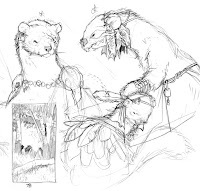 Since other weasel-like species will be featured in Mouse Guard and beyond, I didn't want these guys (and gals) to be just larger versions of the same thing. I worked off of the idea of them being savage, nomadic, hunters that used every bit of everything they killed. Incorporating those previous victims as armor and clothing was fun, and I think really set the fishers apart from any species I have shown so far (and will again...I think this will be a signature of theirs). To the right are my initial concepts for the characters, and ways to make them scarred, battle worn, and terrifying to a mouse. Here is one of the pages in process from the issue that feature them best. They never speak (and not because they are unable, but because they are hunting prey, and wish to remain silent) I mention in the issue they are a pair of mates...though I never spell out which is which, in my head I have the scarred one with the coat of pelts (M) with the skull mask draped with fish (F) and then the porcupine coat (M) with the crab-armor & tiara (F). Fan Art: This week I wanted to share the work of Jackson Sze a concept artist and digital painter. 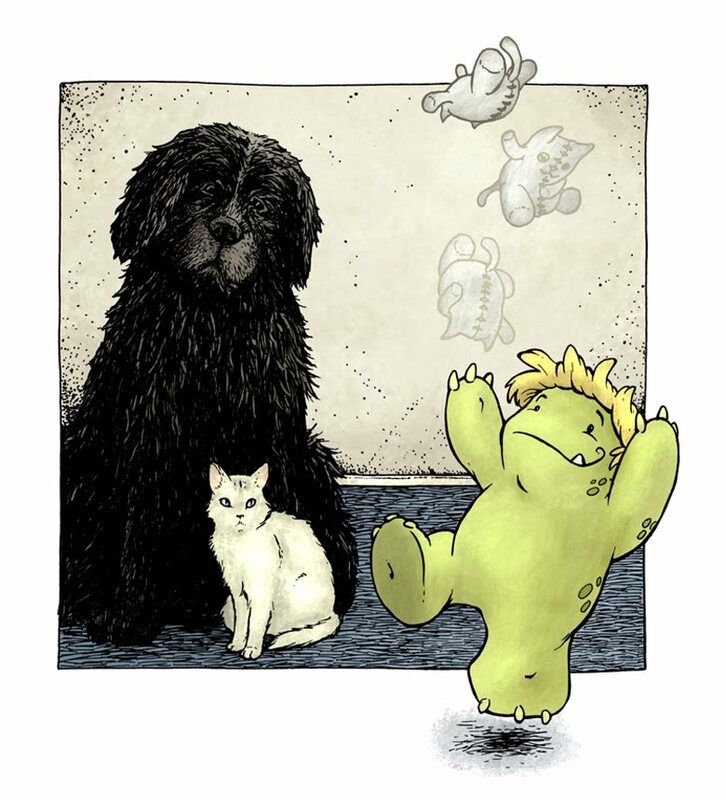 Jackson & I met a few years back at San Diego Comic con where BATTLEMiLK, a portfolio book he contributed to, featured this painting. 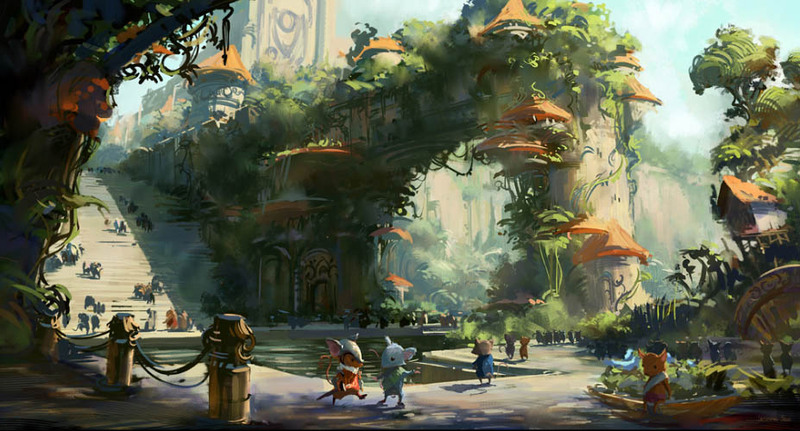 I keep going back and looking at it from time to time being envious of how interesting that mouse city is.